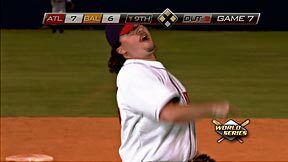 Kenny Powers notched the save in the 2002 World Series victory, and his famous catchphrase “You’re F**king Out!” was born. With his new found success came the fame, the good times, the money, the jewels — all on the reg. Due to his massive ego, offensive comments, drug and steroid abuse, Kenny Powers’ major league baseball career quickly imploded. Out of money, with nowhere else to turn, he returned home to work as substitute gym teacher until the majors called him back up. Back in Shelby NC, Kenny Powers got his girl and fastball back, and thought he would return to baseball with a contract from the Tampa Rays. When the deal fell through, Kenny ditched April out of embarrassment, and headed down to Mexico, to start a new life. South of the border, Kenny Powers assumed a new identity, ran a cockfighting ring, and met his long-lost father. While playing for the local Charros team, Kenny Powers defeated the face of Mexican baseball, and caught the attention of a Texas scout, who signed him to a minor league contract. 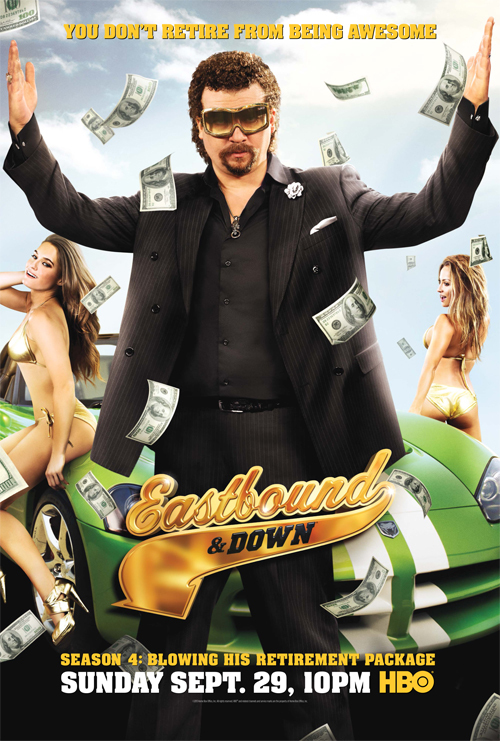 Kenny Powers triumphantly returned home from Mexico, only to learn that April was pregnant with his child. Playing for the Myrtle Beach Mermen, Kenny Powers owned the town (and the team), until April skipped out and left Toby behind. 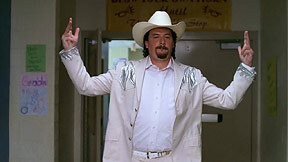 Rewarded for his efforts, Kenny Powers got called back up to the majors once again. While pitching for Texas, he walked off the mound, and faked his own death to start another chapter in his life with April and Toby. 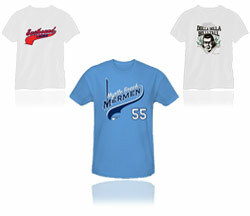 We have a sh*t-ton of Eastbound and Down shirts to choose from! Did Kenny Powers really die in the car crash? A theory we have been working on all season. The answer was no. Chapter 29 / Episode 29 Guide Posted! Episode guide, quotes and image gallery. See what we thought of the series finale. We took a shot at previewing the final season, an interview w/ Maria, predictions, and more. New characters and old favorites. Updated as the season progresses.